The blue player starts with the ball in an outside position. The black player coordinates/times his run to arrive at the moment of the blue players pass as it travels through the cones. After the blue player makes the pass, he immediately returns to the center. The black player receives the ball on the back foot and passes with the inside of the opposite foot to the red player who times/coordinates his run to meet the black players pass as it travels through the cones. The black player immediately returns to the middle after the pass. The pattern continues as the red player passes to the orange player and then orange plays to the blue player. The pattern is continuous as players must work together in coordinated movement. This type of passing pattern is very similar to the actual game. Players move at the right time to provide good passing angles for one another, Soccer is a team sport and requires the players learn to work in groups together. The length of the passes are between 10-15 yards maximum. It is important that players are able to be extremely accurate and quick in their short passing and ball control technique. 78% of all passes in the game are short. Efficient short passing allows teams to possess the ball well. The cones in the drill serve as spacial cues for the brain in terms of positioning. Eventually the coach will be able to remove the cones and the players will be able to keep the same passing pattern going with proper spacing and movement. It is important to have players train in many different variations with the drill. 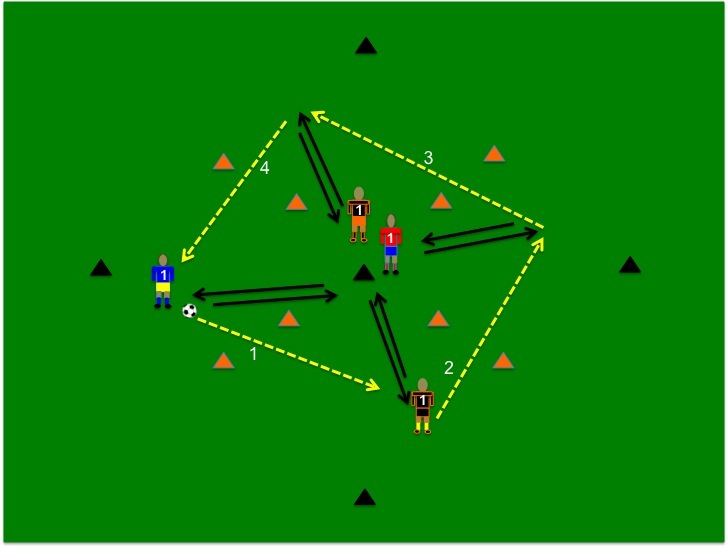 Passing from left to right, right to left, having players start outside and move to the inside (opposite of what they are doing in this example), add players for combination patterns and use two balls. This simple drill is a basic exercise used in cognitive soccer development training. Be sure to check out my website at http://www.soccersmarttraining.com – my online cognitive development course starts March 15th – be sure to sign up early as spots are limited.